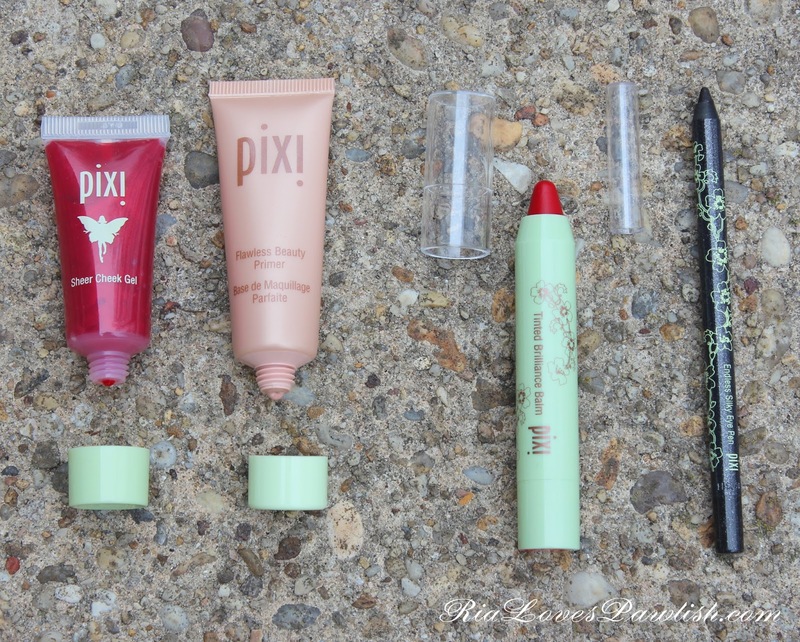 Ria Loves Pawlish: Pixi December 2014 Makeup Samples Swatches and Reviews! 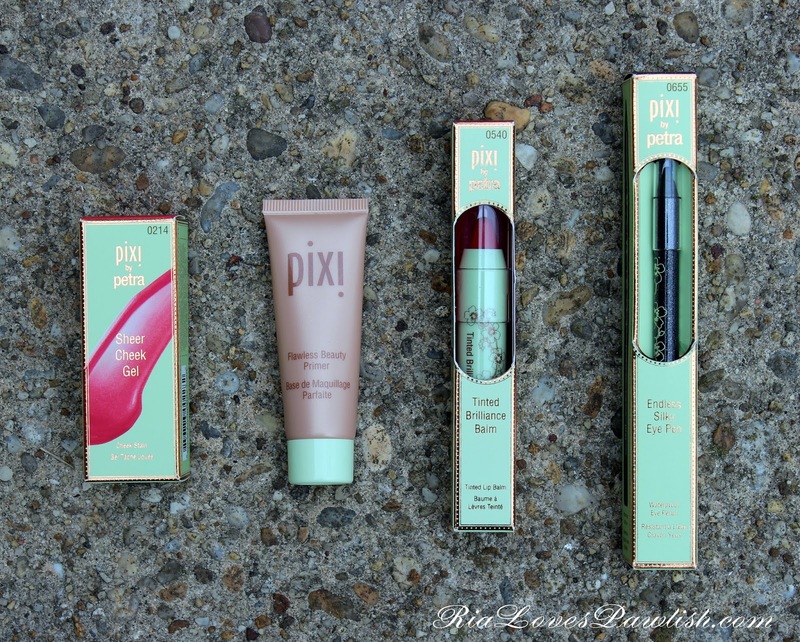 Pixi December 2014 Makeup Samples Swatches and Reviews! had lots of stuff to get done today to get ready for our trip to visit my grandmother tomorrow... whew, felt like a really long day! i really wanted to get this post up though since i'm pretty sure i won't be posting tomorrow, all that travelling always exhausts me. glad i will get to see my grandmother and brother, though! today i have the makeup samples Pixi sent me for December! they are great ones... i definitely squealed when i opened the box :D the products are... Rosy Red Tinted Brilliance Balm, Flawless Beauty Primer, Glimmery Black Endless Silky Eye Pen, Rosy Sheer Cheek Gel. 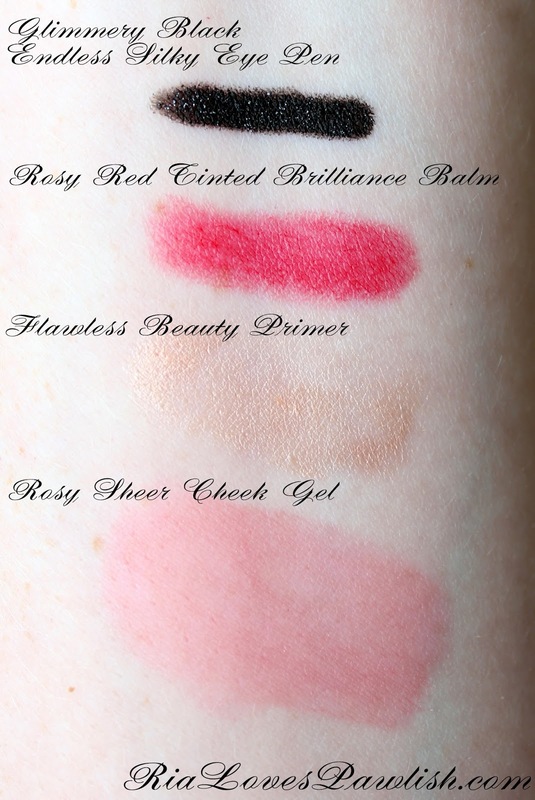 read on for reviews and swatches... an on lip swatch of Rosy Red at the end! Rosy Sheer Cheek Gel ($18) is pretty well described in its name... it's a thin liquidy consistency that's not super pigmented. it leaves a gorgeous stain once blended out... on me it looks like my cheeks have been freshly pinched or i've spent a lot of time outside in the cold! super flattering. Flawless Beauty Primer ($9 for mini, $22 for full size) is a face primer meant to be used under face makeup. it provides quite a glow to the skin, it even gave a lot glow to a matte liquid foundation! there are shimmer particles in it, but i didn't find them to be noticeable on the face... just gave it an all around glow. i found it helped my foundation to stay in place throughout the day, as well! i didn't blend it out very much in the swatch, it sheers out to being quite clear/translucent. 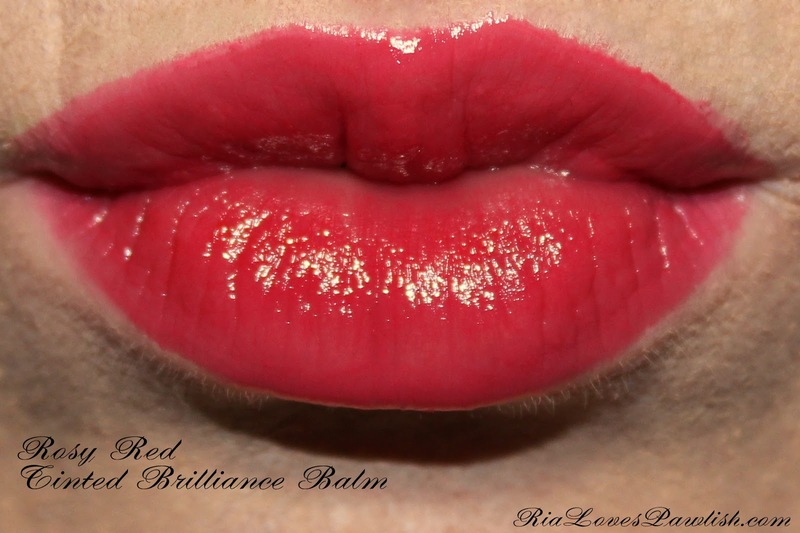 Rosy Red Tinted Brilliance Balm ($14) is a sheer wash of pink toned red, depending how much you put on it will look more pink or more red. these are so easy to wear due to their balmy texture, and they are twist up so no sharpener needed! Glimmery Black Endless Silky Eye Pen ($12) is a gorgeous black pencil liner with silver shimmers. i was SO EXCITED to find this in the sample box, i've been wanting it for awhile now! these pencil eyeliners are amazing... they set up so hard, they don't move at all... even on my oily lids. i can't use them in my waterline because they smudge onto my contacts, but they work great on my lower lid and don't migrate at all! Rosy Red usually looks a bit more red than it does in this photo... i think it pulls a bit more pink on me because i'm so fair. this is one of those great starter reds, an easy way to try and see if you might want to go a bit more daring later!